If the tenant is still in the property but threatening to leave early, there are basically two options: give the tenant a stern warning that you intend to enforce the lease and will take action if he leaves without paying rent, or, work out an early move-out date with the understanding that the current tenant will remain liable until you move in a new tenant. Some landlords opt for the latter strategy only because it may minimize income loss, and make it easier to get a new tenant into the property. Generally, landlords are required to re-rent the property as soon as possible after it is abandoned, despite the lease agreement. So, the only rent that can be collected against the lease-breaking tenant is for the vacant period, and any shortfall in rent between the old lease and the new lease. As far as tracking a tenant down, the information in the rental application, including emergency contacts and personal references, can provide clues as to the tenant’s whereabouts. The more complete and accurate the information in the application, the more likely you — or a collection service — will find the tenant after he skips out. This is one reason why it is crucial to verify the information in the application before renting to the prospective tenant. Unless there is some local tenancy rule prohibiting it, you should be able to require tenants to update information in the rental application, such as a new job, emergency contact, or phone number. Also, develop the habit of noting banking information on monthly rent cheques. That is useful when it comes time to collect a judgement. If the tenant tendered a security deposit, then he likely must reveal his new address, or it may be an option to request a forwarding address from the postal service. Despite the tenant’s breaking the lease, if you are holding a security deposit, you still need to follow your local rules concerning any deductions and accounting for the deposit. If the tenant skips out without paying the remaining rent, you can demand payment or hire a collection specialist to collect the money owed. A collection company may get better results, but will charge for the service. Many companies will accept the debt on a contingency basis where you pay only if they are successful. If the tenant contests the debt or won’t pay, you may be forced to pursue a judgement in court. It’s likely you will need such a judgement in order to garnish the tenant’s wages or bank accounts. 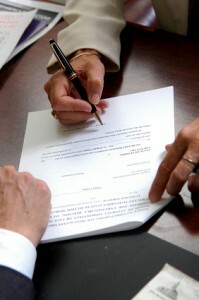 You may have the option to use arbitration or dispute resolution, which can save money. Otherwise, landlords usually seek a judgement in their local smalls claim court. There, you will not need to have an attorney, but you will have to follow all of the court’s rules to the letter of the law or risk having the case dismissed with no resolution, or paying multiple filing fees. At a hearing, the tenant will be able to raise defenses for breaking the lease. Those commonly include claims about the condition of the property. Be prepared. Bring adequate documentation to prove that the property was well-managed and the tenant did not raise repair or maintenance issues that were not met. The move-in checklist, the lease and records of communications may help overcome a tenant’s false claims. Once you have your judgement, you can take more aggressive steps to collect the money from the tenant, including garnishments. You also need to be prepared to find another tenant quickly. Be extra vigilant in screening this new tenant. Verify the information on the rental application, check the prospective tenant’s credit history, and speak with the current and previous landlords to minimize the chance of renting to another problem tenant. Another valuable tool is signing the new tenant up to Report Tenant Pay Habits. This carrot-and-stick strategy of tracking rent payments serves as an incentive to tenants who want to build a good credit history, and a deterrent to tenants who don’t want to wreck their credit by failing to pay rent. In addition to what Chris has noted above, and good article by the way Chris, I would have the new tenant read and sign the NOTICE TO TENANT form and I would provide them with a copy. I would also provide them with a copy when I need to, i.e. consistent late payment, very late payment, or breach of lease. It costs nothing to use this form, it costs nothing to report tenant pay habits to TVS/ATS. These are tools to help landlords & property managers minimize risk of income loss. Tenants who know that pay habits are being reported , are more likely to be on time. Don’t forget to also advise them about the CERTIFICATE OF SATISFACTORY TENANCY…this form is the carrot. i.e. Make your rent payments on time and I will provide you with THIS at the end of your lease term. Sadly in Ontario, when a tenant breaks a lease, the landlord usually has no effective recourse. Further to this, our provincial rental law has a clause that allows the tenant to break the lease and give early notice of termination if the landlord refuses to allow the tenant to assign the lease to another tenant. In Ontario it is critical to collect the tenant’s SIN number on the rental application as this will likely be the only hope a landlord has of finding the tenant to collect damages once the tenant has vacated.